It’s estimated that more than $10 billion dollars will be spent betting on March Madness in the US alone and last year, more than $2.5 billion was spent just on bracket entry fees! With staggering numbers like these, now is the time to make your move to a pay per head. If you have not done so, then you must check out the many great features that a top-rated company such as Realbookies.com can offer you. Let’s face the facts, if you are any kind of bookie with any kind of client base, whether it be small, small-medium, medium-larger-medium, or even a larger client base, you know one thing for certain; your clients love to bet March Madness and the excitement is heating up now. The final week of the regular season is ending, and the conference tournaments get underway in the next couple of days. The real beauty is the sheer volume of the games. With more than 300 teams in Division 1A College Basketball scattered throughout 32 individual conferences… there is always a game to bet on and usually a great game. The fans are on it and they want a great place to bet. If you build it, they will show up. If you offer it, they will stay and if they have a chance to win a little and have quick and timely payouts, they will shout your name from the rooftops. We know sports bettors want to bet on sports and they certainly want to bet on March Madness, how do you get them to stay with you? You offer them the best lines and odds, you offer them great wagering options, and you offer them quick and fast payouts. A full sportsbook with all the major sports available, as well as every kind of wagering option that is popular in Las Vegas sportsbooks and offshore books. Great casino action with all the popular casino games. Accounting, the entire accounting process is done for you. Wagering, no more handwriting tickets, grading tickets or keeping up with rain outs, a push, or tickets with no action. Customer service, when your clients need to speak to an agent or even phone in a bet, they can do it. They can call a live agent and speak with them on the phone, in English. Low cost, you do not have to be rich to work with a Pay Per Head. As a bookie, you will have many different players with many different income levels. You must be faithful to your bottom line. It is mandatory that you qualify each credit player. How much can your players afford to gamble in a week, how much do they earn? You must find out their playing habits, what they like to bet and how much they bet? How do you learn this information? Through experience, through playing and deposit history. You would never spot someone $1,000 on credit simply because they were wearing nice shoes and an expensive looking shirt. You get to know them first and understand how they play. One of the biggest mistakes made by bookies is “taking their word for it” don’t get caught in this trap. It will kill your business. A lot of people say a lot of things and you will always hear from them when times are good. 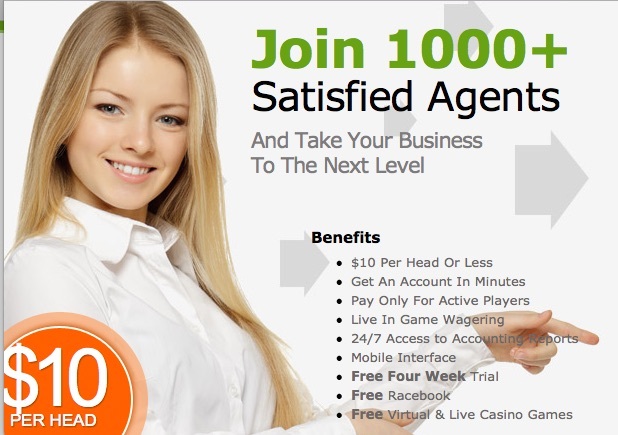 Let them get down to you for $3,000 or $10,000, then see how often the phone rings. The bookie business is a lot of fun and there are many rewards, however, the job is also difficult, and it can be most frustrating at times. The trick to this game is knowing your clients and knowing how they gamble and what kind of money they spend. If your goal is to make a nice salary as a bookie, then you must focus on one project, and that is bringing your clients to your pay per head. Basketball is in the air and the beauty of www.Realbookies.com is you can try them for 4 weeks, free! Jump on this deal now and you will have a very good idea of what a PPH can do for you. In two weeks, you will be convinced this is the way to go and you will realize what a great deal this is for not only your clients, but for you. The cost of operating a pay per head is minimal and starts at around $7 and can go to as little as $10, depending on what type of service that best fit your clients needs. Remember, this is about you and your clients. You should be comfortable with this process, you are the one that found your clients and you are the one building this business; be comfortable. Stop beating your head against the wall and come out from under the rain. www.Realbookies.com can help you change your business perspective and can fire you up for what is sure to be a fantastic month of March. March madness is on top of us and it will be better than ever. Remember folks, it matters not how many players you have. You may have 3 or you may have 300. The point is that you are doing the right thing for your peace of mind as well as your clients benefit. You want them to come back for baseball and the way to get them back is to build the bridge now.